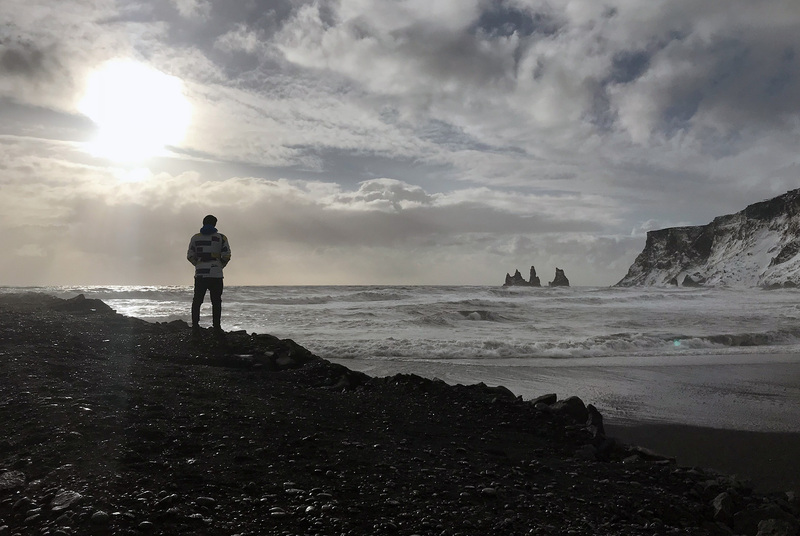 Iceland - 11 tips for your trip - money, sights and experience | fischirocks! This was the third time I’ve been to Iceland. I love this country. The impeccable beauty, astounding environment and elusive variety of this small nearly arctic island take my breath away, every single time. But with all the bliss you can enjoy while visiting Iceland, there are a few pits you could fall into. If you are a venturesome traveller like I am, wanting to experience the country, while still having fun and getting drunk from time to time, these tips are perfect for you. The following suggestions are based purely on my experience. If you are a city tourist or a luxury vacationer, these may not be suitable for you. For those of you who want to enjoy more than just visiting the most popular sights, I am happy to help you out. It’s not cold in Iceland (near the coast). But it feels cold. Iceland, despite its name, is not a cold country. The surrounding ocean controls the air temperature really well, resulting in a relatively mild climate for its latitude. The average low temperature in Reykjavík is around 1.9°C year round, with the lowest value of -3°C in January. This is higher than my hometown in Austria. (I know, it will be very different in the middle of the island). It won’t be really warm in the summer, with temperatures averaging around 12°C in July, but you won’t freeze to death because it’s cold. You’ll freeze to death because the winds can be fierce. Really fierce. With a topography that has no real natural barriers in the coastal regions, you are a victim to strong winds. I experienced winds close to 130 km/h, with air temperatures of -3°C. This feels like around -25°C. So, pack your clothes accordingly! I would really suggest layering up. Most of the time your ski or thermal tights will be enough, worn with regular trousers like jeans. On my upper body I like to wear a T-shirt under a long-sleeved functional shirt, along with a hoodie and some winter jacket. If you are going to do some hiking and stay outside for extended amounts of time, leave your nice looking fashionable coat at home, and go with your ski jacket. Something that I really like to do is wearing ski socks over a regular pair of socks. The layering really keeps you warm and keeps the fierce wind away! For shoes, I went with my Winter Trecking Salomons. It’s not the best choice to go clubbing, but you get around well. I don’t think it is necessary to mention, but I’ll do it anyway – bring a wind-proof cap and gloves as well. If you freeze easily, also consider packing a ski mask – you will thank me for it after the mandatory pictures at Gullfoss! Of course, if you just want to hit the bars in Reykjavík, that’s not necessary – but as soon as you go into the wild, it’s better to have one extra layer to take off. Your best friends are battery packs. Imagine yourself driving through the most daunting environment you have ever seen. You want to create jealousy on Facebook. You take out your camera, take a picture, and two minutes later, before you get the perfect shot – your battery dies. The hostile winds combined with the temperatures can take a great toll on the batteries of your devices. Be prepared, and take some high power charging devices with you, you are going to need them. Plan your trip, and decide what you want to see. Iceland is a big country. Not big in a Russia way, but it’s not to be underestimated – especially because you can only drive around at a maximum of 90 kilometers per hour. If you go on a one week trip, you are going to face some difficulties. Driving around takes a lot of time, and driving in the dark is not a good idea if you don’t know the streets (which you don’t). Mark out the spots you want to visit, and try to make a plan that allows you to do the distances. Even if you just want to visit Reykjavík and the surrounding area, plan ahead. Book your tickets for the Blue Lagoon in advance, check your hotels, and be sure to get from Keflavik (where the international airport is) to Reykjavík with a booked bus, if you do not have your own car. Tourists are flooding Iceland – you are just going to wait in line if you don’t take this into account. Even worse – you could just be dismissed without a voucher for a prepaid booking. Even though you got your holiday in Iceland perfectly planned out, you can never be sure to keep your schedule. The massive amount of other tourists, the ever-changing weather and the possibility to discover secret places may alter your schedule completely. I have experiences of snowstorms restricting my journey, or busloads of chinese people restricting me from entering the Blue Lagoon. Don’t take it hard – there is much more to see and experience in Iceland! The most famous sights will be overrun. Iceland faces a great challenge – it has become a really popular destinations for tourists around the world. The good thing about that is that most of the tourists will stay within the Reykjavík area and around the Golden Circle. One of my favourite spots in the whole wide world is at the Gullfoss Waterfall on the Golden Circle, and I visit it every time I come to Iceland. It will be overrun by busloads full of tourists, taking the easy way for a perfect shot on their mobile phones. It will be really expensive to order anything at the adjacent shelters. But it is worth the hassle. Experiencing the great geyser, Gulfoss and visiting Hallgrímskirkja never disappointed me. Just be sure to buy your Blue Lagoon tickets in advance. There is no chance to get in if it is sold out. Buy as much alcohol as you can on arrival at Keflavik airport. Don’t blame me, but I like to get to drunk from time to time. Trust me on this one – to comfort your wallet, you want to buy as much booze as you can on arrival. Every single person entering Iceland will be allowed to buy some alcohol tax- and duty-free at Keflavik airport. This is like six bottles of wine per person, or an equivalent amount in other drinks, like beers and spirits. You’ll never get a cheaper option to buy it on your trip! In a bar, you are likely to pay 8€ (or 1000 ISK) for half a litre of beer. Save yourself some money and use some takeaway from the airport. Also, if you do smoke, bring the packs along. Your wallet will thank you. But trust me, you should. You can pay everything with your credit card, from parking fees to beers, from restaurant fees to gas stations. Iceland is expensive. I mean really expensive. If you live in Europe or the United States, you can just expect to pay double on everything. And this estimation is one on the low side of the truth. Make a budget – and trade in your Euros or Dollars before, because it is really easy to lose your grasp of money in Iceland. Paying with local money helps you a little bit with that. I myself never touched Icelandic money in my life – but my credit card bill always reminded me of the hard truth afterwards. Iceland is such a beautiful country, with ever-changing landscapes around every corner that you drive to. Don’t be someone who judges the country just on Reykjavík alone, although the thought of this beautiful city is tempting. There are car rentals everywhere, so just get into one, and drive out to experience the beauty of the landscape. Even just driving around is mesmerizing. The roads are in good condition, and the 90 km per hour speed limit restricts you from skipping a gem in the landscape anyways. Some of the most beautiful sights are just reachable on a road trip, so try to take this into account. If you want to know how the conditions are going to be, check out road.is for road and vedur.is for weather conditions daily. I would absolutely recommend renting a car with camping capabilities from rent.is. They are perfectly prepared for snowy roads, and can keep you warm even during a snowstorm, thanks to a minimum of 10 hours of heating without draining the battery of your car. Imagine driving around the whole island, and not being tied to arriving at specific places on time. Just visit a campsite near you, and go to sleep. Drive along in the morning. To the next gorgeous place that you encounter. …unless you can’t handle the conditions. Everybody can drive on a dry road. Driving on a wet road is more difficult, but driving on snow is a lot worse. Please, do not drive on snowy roads unless you have at least three years experience of winter road conditions. In Austria, if an advancing car flashes their lights, it usually means to be aware of cops further down the road. In Iceland, if you see multiple cars showing these signs, you are heading into trouble. Icelanders know about the driving habits of tourists and want to warn you. Ignoring these signs, I got caught in a snowstorm for nearly two days, just because I wanted to reach my next destination. If you are in doubt, stop and ask the locals – they will tell you what to do! Walk. Hike. Take your time. Just enjoy the beauty of Iceland. For my final advice, this should be a no-brainer again, but it isn’t. Iceland has so much to offer, people get overwhelmed. For example the DC-3 plane wreck after a 4km hike. Don’t be one of the tourists to visit this great country just to take pictures. Take your time. Breathe in. Taste what clean northern air tastes like. Close your eyes. Think back to your everyday life. Open them up again. Everything will be different. The endless fields of moss and stone, the ice on the ground, the black sand beaches, the glaciers and waterfalls, I can’t even stop to tell you about Iceland’s beauties. I just got one wish – take your time. And walk. You will experience so many beautiful things on your trip, it’s not comparable to anything you have experienced before. To savour this beauty, just follow my advice – walk and hike. There is no better feeling than the reward of seeing said beauty after you strained yourself. Driving to an amazing spot is one thing, but having to work for it is far better. Walk, hike, in this beautiful gem of our world, and experience the gratification of seeing a few of the most amazing places and sights this planet has to offer.